Twenty thousand years ago, when humans were still nomadic hunters and gatherers, low concentrations of carbon dioxide in the atmosphere allowed the earth to fall into the grip of an ice age. But despite decades of research, the reasons why levels of the greenhouse gas were so low then have been difficult to piece together. New research, published today in the leading journal Nature, shows that a big part of the answer lies at the bottom of the world. 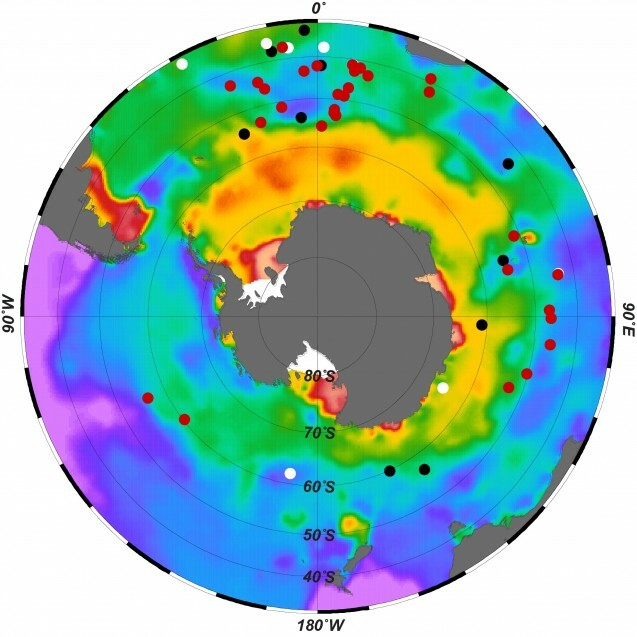 Sediment samples from the seafloor, more than 3 kilometers beneath the ocean surface near Antarctica, support a long-standing hypothesis that more carbon dioxide was dissolved in the deep Southern Ocean at times when levels in the atmosphere were low. Among other things, the study shows that during the ice age, the deep Southern Ocean carried much smaller amounts of oxygen than today. This indicates that photosynthetic algae, or phytoplankton, were taking up large amounts of carbon dioxide near the surface. As dead algae sank to the depths, they were consumed by other microbes, which used up the oxygen there in the process. The scientists found chemical fingerprints of the oxygen level by measuring trace metals in the sediments. The evidence “is a long-sought smoking gun that there was increased deep ocean carbon storage when the atmospheric CO2 was lower,” said Sam Jaccard of the University of Bern, Switzerland, the study’s lead author. The study also shows that variations in carbon-dioxide storage in the Southern Ocean were probably behind a series of natural “wobbles” in atmospheric levels of about 20 parts per million that took place over thousands of years. The study suggests that the wobbles were probably caused by changes in the amount of iron-rich dust, which fertilizes phytoplankton, being blown from land onto the ocean surface. Levels may also have been influenced by varying amounts of carbon being released from the deep ocean as ocean currents changed, said the authors. The study was also coauthored by Alfredo Martinez-Garcia of Germany’s Max Planck Institute for Chemistry.